(Photo: . REUTERS / Amr Abdallah Dalsh)Hala Shukrallah, the new president of the Dostour liberal party, talks during an interview with Reuters in her office at the party's headquarters in Cairo, February 25, 2014. Shukrallah won the elections of the party last Friday to succeed Mohamed ElBaradei, a former U.N. nuclear agency chief, as the party's president. 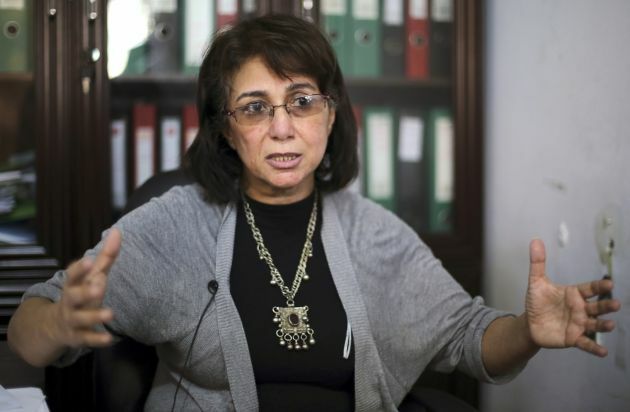 CAIRO (Reuters) - The first woman to head a major Egyptian political party said on Tuesday she saw dangers for democracy if Egypt's wildly popular army chief becomes president, without guarantees that he will not be above the law. Field Marshal Abdel Fattah al-Sisi toppled Egypt's first freely elected president, Mohamed Mursi, in July after mass protests against his rule, and the army-backed authorities have since suppressed the Islamist leader's Muslim Brotherhood. Sisi has won a fervent following in the past eight months. His image appears on posters, t-shirts and chocolate bars and most Egyptians believe he will run for president. Hala Shokralla, a Coptic Christian, expressed fears that Sisi's popularity would overshadow efforts to lead Egypt to democracy and end political turmoil gripping the country since a popular uprising toppled autocrat Hosni Mubarak three years ago. Sisi's removal of Mursi followed huge demonstrations on June 30, which supporters of the army takeover call a revolution. "There is a danger here when you bring in someone who has that position and who is tied to a moment like June 30, which was truly created by the people," said Shokralla, head of the liberal Al Dostour (Constitution) Party. "We forget that...the people have a right to question, hold (their leaders) accountable and withdraw confidence when they don't see their rights being implemented," she said. Al Dostour was founded by Nobel laureate Mohamed ElBaradei after the anti-Mubarak revolt to represent liberal, secular-minded Egyptians, but has yet to generate mass support. Sisi's political roadmap is expected to lead to presidential and parliamentary elections within months. He has promised to bring stability and democracy to the most populous Arab nation. But Egypt's political transition has stumbled and Islamist militants based in the Sinai peninsula have stepped up attacks on security forces since Mursi's overthrow, killing hundreds. Human rights groups accuse security forces who cracked down on Mursi's Brotherhood of widespread abuses. Police crushed two pro-Mursi protest camps, killing hundreds of people. They have arrested thousands more and put Brotherhood leaders on trial. "The dangerous development is that security forces considered that June 30 gave them a carte blanche to return to their role in the past, as if January 25 never happened," said Shokralla, referring to the revolt that toppled Mubarak. Mubarak's fall raised hopes that security forces would be reined in. But critics of the army-installed government, which resigned on Monday, say the old police state is back. The interim-government passed a new law severely restricting protests. State-run media praise the police and army and portray any dissent at treason. Shokralla replaced ElBaradei as leader of Al Dostour after he quit as Egypt's vice president in the army-backed government and went abroad, expressing misgivings over the blood spilled in the security campaign against Islamists. Security forces have since spread their net wider, jailing secular activists, even those who played a prominent role in the uprising against Mubarak and who backed Sisi's ouster of Mursi. Lawyers and relatives of political detainees say they were tortured in police stations and prisons. "We are facing high risks today," said Shokralla, who was a leftist activist in the 1970s when she was arrested under then President Anwar Sadat. "We find many of the symbols of the revolution being sent to prison, those who participated in June 30 and those who participated in January 25 and their image is being distorted." Egypt, a strategic U.S. ally because of its weight in the Arab world and peace treaty with Israel, has been dominated by military men for decades. The uprising that ended Mubarak's repressive rule raised hopes of a democracy led by civilians. A Sisi presidency would raise serious doubts about Egypt's democratic credentials. "Are we going to face yet again someone who will not be subject to questioning, accountability and withdrawal of confidence even though these are included in the constitution? Will he (Sisi) be put above the law and the constitution?" Shokralla asked. "These are all risks which we must vocalise out loud and we must demand guarantees (of these rights) if Field Marshal Sisi does run for president."